Forage & Pasture rocked up to Santa Barbara Farmer’s Market to explore some winter exotic fruits with Robin Smith of Mud Creek Ranch and Robert “BD” Dautch from Earthtrine Farm. Robin knows what she’s talking about: her 60 acre farm has been certified organic for nearly 15 years, and its specialty is exotic fruits as diverse as Tahitian and chandler pomelos, cocktail grapefruit, Rex Union grapefruit, oro blanco grapefruit, kishu mandarins, palestine limes, monachello lemons. Meanwhile the ‘Organic Alchemist’, BD, has been farming for nearly 40 years and is famous for his culinary herbs. Earthtrine is home to more than 20 varieties of herbs, including rosemary, thai basil, lemon basil, oregano, fennel, chervil, cilantro, mizuna, horseradish, chamomile flowers, lovage, and mustard-family plants. BD also grows exotic fruits, organic salad greens, bitter greens, assorted mixed vegetables, and 10 varieties of his popular figs. The flesh is white and creamy, dark brown seeds embedded. When ripe, the skin is green and gives, slightly, to pressure. Its flavor a blend of peach, banana, pineapple and papaya. Chilled and eaten with a spoon, it becomes the ice cream fruit. The name originates from the Quechua word chirimuya, which means ‘cold seeds’, as the plant grows at high altitudes. A cherimoya flower opens up as a female for three days, then becomes a male for three days but they never pollinate, so they must be quickly and carefully hand-pollinated. To eat a cherimoya, cut in half lengthwise and scoop out the velvety spoonfuls, peel and cut into cubes for salads, or puree and use in pastries or tarts. Make sure to remove the large black seeds which are inedible. 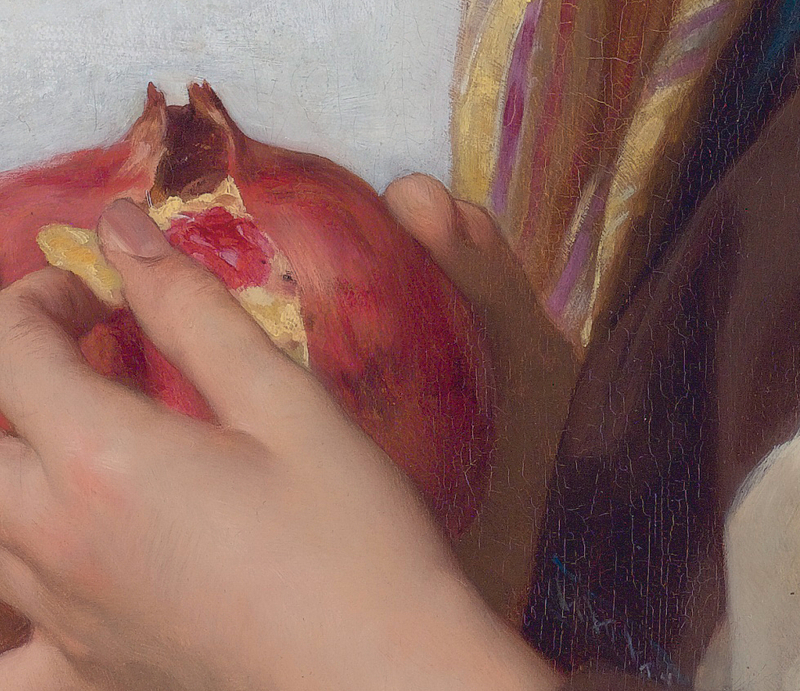 The name pomegranate derives from medieval Latin pōmum “apple” and grānātum “seeded”. In China the pomegranate’s name means seed, but it also means offspring; a fruit with so many seeds has become a sign of fertility there. Soldiers in World War I commented on the pomegranity shape of early grenades – hence the French term grenade (for pomegranate) has given its name to the weapon. The ancient city of Granada in Spain was renamed after the fruit during the Moorish period.